water. It is a tale of rivers diverted and dammed, of political corruption and intrigue, of billion-dollar battles over water rights, of ecological and economic disaster. 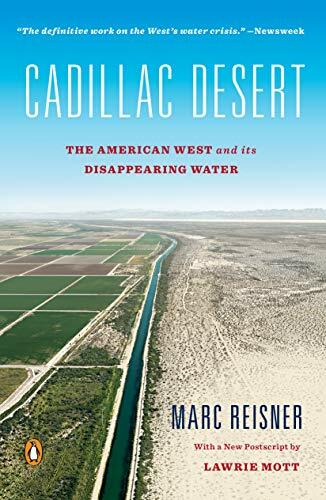 In his landmark book, Cadillac Desert, Marc Reisner writes of the earliest settlers, lured by the promise of paradise, and of the ruthless tactics employed by Los Angeles politicians and business interests to ensure the city's growth. He documents the bitter rivalry between two government giants, the Bureau of Reclamation and the U.S. Army Corps of Engineers, in the competition to transform the West. Based on more than a decade of research, Cadillac Desert is a stunning expose and a dramatic, intriguing history of the creation of an Eden--an Eden that may only be a mirage.This edition includes a new postscript by Lawrie Mott, a former staff scientist at the Natural Resources Defense Council, that updates Western water issues over the last two decades, including the long-term impact of climate change and how the region can prepare for the future.